July 10, 2011 by Alphageek in "alphageek", "discovery", "pizza"
This is an article I have wanted to write, since the concept of Alphageek Talks Food was first conceived. Even before the site went live, I knew that I was going to write this article. While my passion is taking something we all do, eating, and trying to turn it into entertainment, this story is about someone who craves one thing: good pizza. Since I moved to Fredericksburg, VA over 20 years ago, I have heard continuous debate about who has the best pizza in the area. Although I have not tried them all, I have tried a few and some are pretty good. However, they all pale in comparison to the pizza that "The Professor" has prepared for me in his pizza oven. Pizza from "The Professor's" pizza oven is simply the best pizza I have ever had. Pictured above is the oven in question. As you might imagine, it is fairly large, approximately 5 feet long by 4 feet wide and about 6 feet high. In the picture above, the fire is already lit, bringing the oven up to a temperature around 850 degrees F. This is some serious heat here. Serious heat calls for some serious design, and this oven took about two years to construct. Planning seems to be important to use the oven, because "The Professor" informed me that he starts the fire about a day before using the oven, to achieve an even temperature in the oven. "The Professor" began raking the coals around inside the oven, and declared that it was too hot. He grabbed a shovel, and removed several shovel fulls of glowing embers. He tells me the biggest danger is getting the oven too hot. The only danger I observed was the rake that is used to move the embers around caught fire. 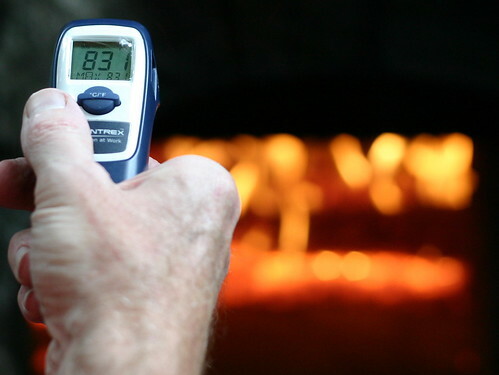 "The Professor" then took a final temperature reading, pictured below, and declared the oven ready for baking. Well, the oven was ready after he scrubbed out the ashes in the cooking area, and inserted some firebrick to hold the coals in the back of the oven. "The Professor" started out with something simple, some flatbread. 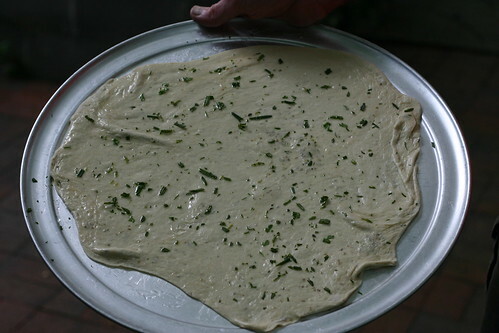 He simply took some dough with herbs, and spread it around on a pizza pan. Well, actually "Mrs. Professor" did this part. Just to make life really confusing, "Mrs. Professor" IS a professor, and "The Professor" is not. But I digress, and you can see the dough below. 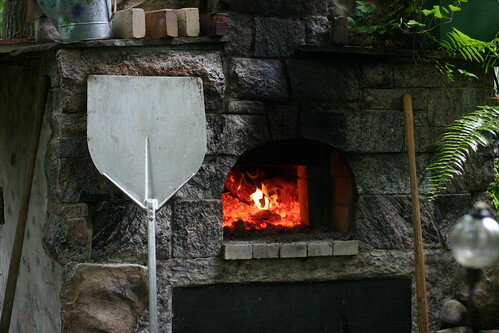 The pan is then placed in the pizza oven and a miraculous transformation takes place. The dough goes in all ordinary looking, and comes out looking like something you would get at some exclusive restaurant, somewhere that charges lots of money for good simple food. What emerges is some of the best bread you will ever taste, and I took a picture for you below. Not to be outdone, Mrs Alphageek wanted to get in on the action too. 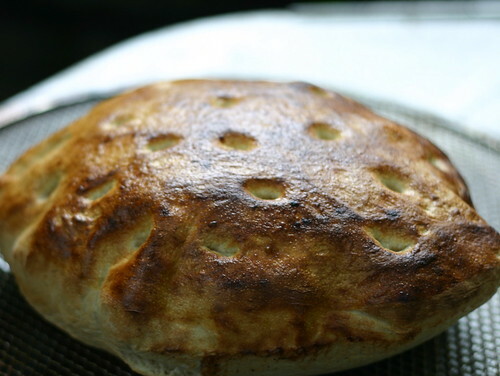 She decided to try to recreate some Turkish bread that we recently sampled. She took a few minutes, and read some recipes online, and then mixed up some dough before we headed over to "The Professor's" house. 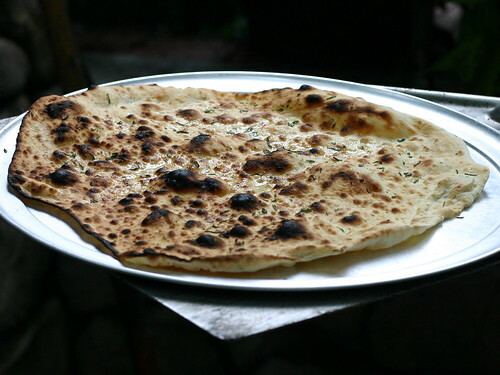 The bread we tried was somewhere between a flatbread and a regular loaf of bread, about an inch thick all around. As the loaf was placed in the pizza oven, it rose a little more, a lot like a pita pocket. However, what emerged was again some of the best bread ever. The bread was amazing for the first attempt and you can see it below. The preliminaries were then over, and we moved on to the main event: pizza. Anyone who has a rack like the one below means business. 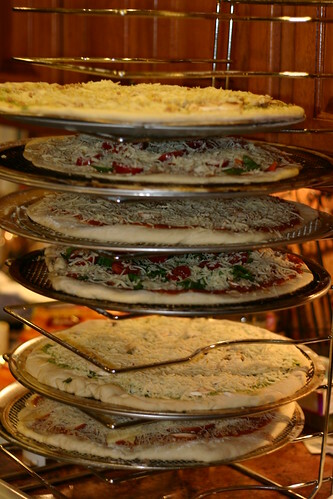 This rack contains some family favorites, such as pesto pizza and sausage pizza. 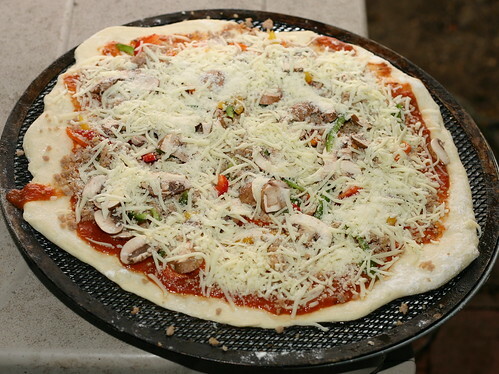 We started out by placing a sausage pizza, pictured below, into the oven. While the pizza baked, we talked about the oven and its construction a little. "The Professor" was apparently ahead of the pizza oven craze by several years. Now, you can even buy an entire oven several places online. People even make pizza in those Green Eggs. Hmm.. I'll bet one could make pizza in a Weber Grill too. He also mentioned that he would put a larger door in, if he made one change. While he can fit about six pizzas in, he can only manipulate about three pizzas at any one time because of the size of the door. We waited about six or seven minutes, and the finished product emerged below. I know I keep repeating the phrase best pizza, but it certainly applies in this case. The pizza that emerged is just different than almost anything one can get anywhere else. The ingredients actually can cook in the oven, due to the high heat. 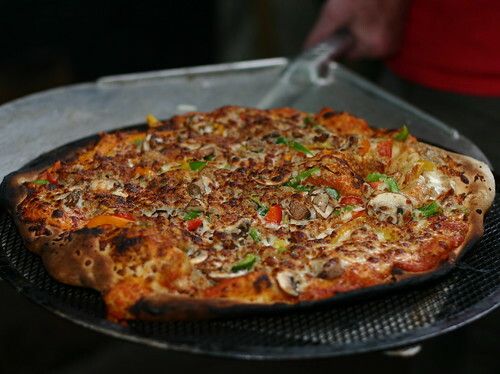 The high heat also helps dry the crust, keeping the crust crisp, and not gooey and limp. The Alphageek would like to thank "The Professor" for taking the time to show me around the inner workings of a pizza oven. I now know where the best pizza in Fredericksburg is, it is right in this oven. If you ever get a chance to see how these oven work, don't pass it up, and give me a call!